Well flaming June indeed! All we seem to have had, when it's not been raining, are warm extremely humid and cloudy days. Rather like Venus before it went to pot! Finally got a long enough spell yesterday afternoon to grab some shots. As usual it's with the ST102 and Lunt module for the CaK (close up is with the ED80), the PSTDS for the Ha. Camera is the DMK31. 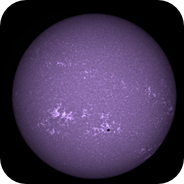 The white light shot of AR11777 was done with the ED80 and baader photographic film + 2.5x barlow and the QHY IMG132E.